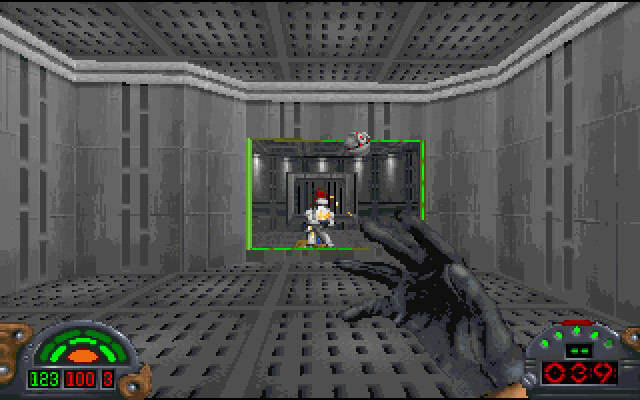 Kyle Katarn's first outing is more a Doom Killer than a Doom Clone. In the opening cutscene of Star Wars Dark Forces, we see Mon Mothma hire a mercenary called Kyle Katarn to infiltrate an imperial facility and steal the Death Star plans. The Alliance contact Katarn again after a rebel base is destroyed by black-clad stormtroopers. Kyle discovers The Empire are building an army of battle droids called Dark Troopers. Dark Troopers can’t be bargained with, can’t be reasoned with. They don’t feel pity, or remorse, or fear. And they absolutely will not stop until the Rebels are dead. Attempting to stop the Dark Trooper project takes Katarn on a whirlwind tour of the galaxy, blasting Stormtroopers, Imperial officers and alien bounty hunters. 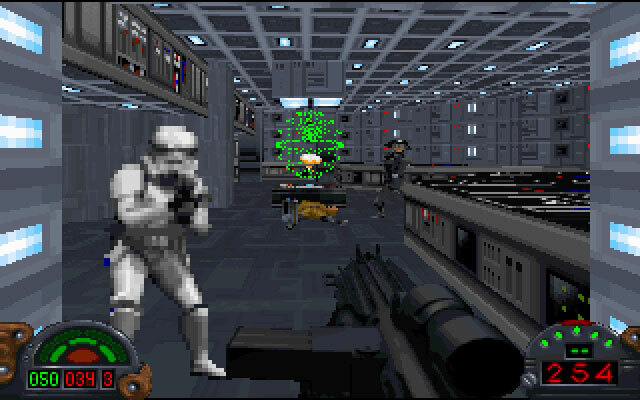 Whether on alien planets or aboard spaceships, each one of Dark Forces’ 15 levels is rich in Star Wars flavour. The game brings its own cast of characters, ship designs and locations to the Expanded Universe which sit right alongside that established Star Wars-y-ness. 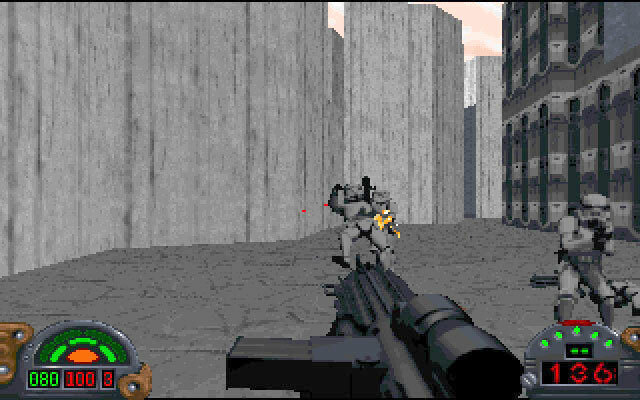 Dark Forces is defined by huge levels, designed with a more vertical experience than other FPSs from the 90s. It’s not just slopes and flights of stairs. Dark Forces features multi-tiered cityscapes, with elevators, bridges and towers. It’s a big, 3-dimensional experience and multiple objectives to be achieved in each stage can lead to you flailing about a bit aimlessly. All the weapons you’d expect from a Star Wars first-person shooter are present. From the humble blaster pistol and the E111 rifle to good ol’ thermal detonators, right up to exotic plasma weapons and explosives. Some of the weapons have alt modes which was a thing back in the 90s. Thumbs up who remembers when alt fire modes were a thing! Despite all the guns, Kyle Katarn has probably the strongest punch guy in Star Wars. Punching Grans, Trandoshans, Gamorrean Guards, Stormtroopers. He even punches a Kell Dragon to death. He’s going about the galaxy punching the life out of everything. What a bloody hero. Is Dark Forces still good today? iMUSE MIDI music for me is an integral part of the DOS experience and Dark Forces has some really charming MIDI music. The charming 3D graphics are highly rated by me. I think these 2D sprite-based games age better than the 3D games which came immediately after them. 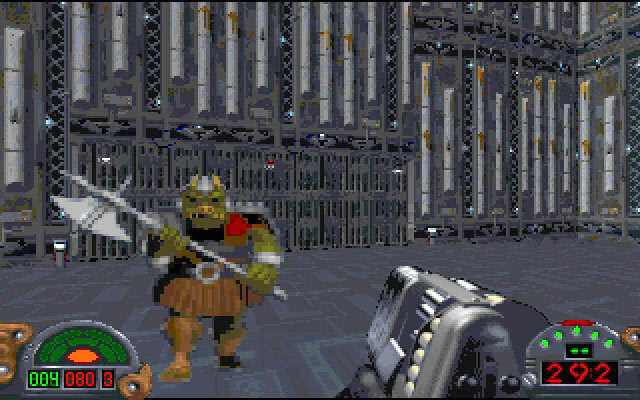 I really like Star Wars Dark Forces. Plenty of “better” PC and FPS games have come out since. There are even newer games in the series like Dark Forces 2 and Jedi Knight 2. I find myself playing Dark Forces again because it’s a short little game. I can blast through over a couple of nights. It’s the epitome of retro gaming for me; fire it up, play for half an hour or so and walk away. As with all games on Second Wind, this is available to purchase on GOG and Steam. If you’re new to SW games and are looking for a game to get you into it, Dark Forces is a brilliant place to start. Watch my Star Wars Dark Forces review on YouTube here. One of the best DOS shooters ever made. More complex than DOOM with all the technology LucasArts could throw at it. An absolute must-play.